Small-town teacher Johnny Smith is involved in a car accident that leaves him comatose for approximately six years. 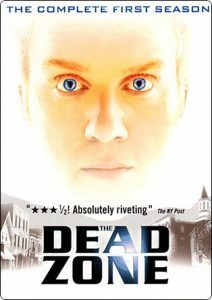 After regaining consciousness, Johnny begins having visions of the past and future triggered by touching items or people; doctors attribute the visions to activity in a previously unused "dead zone" of his brain that is attempting to compensate for the impaired function of the portions injured in the accident. Johnny also learns that his fiancée, Sarah, gave birth to his son in the interim following the accident, but has since married another man. With the help of Sarah, her husband Walt, and physical therapist Bruce, Johnny begins using his abilities to help solve crimes. However, his attempts to do good are complicated by intermittent visions of apocalyptic events brought about following the future election of congressional candidate Greg Stillson.